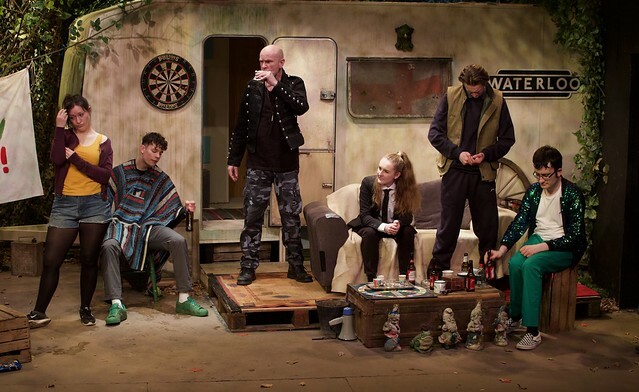 We are sweetly serenaded into the atmospherically lit woodland glade by Phaedra (the feisty fairy Sophie Maybury) and join the ebullient camo-clad king of misrule, Johnny ‘Rooster’ Byron (a swaggering, all-consuming performance of extraordinary intensity by Matt Tully) at his Council-condemned caravan site with his raggle-taggle retinue of revellers. 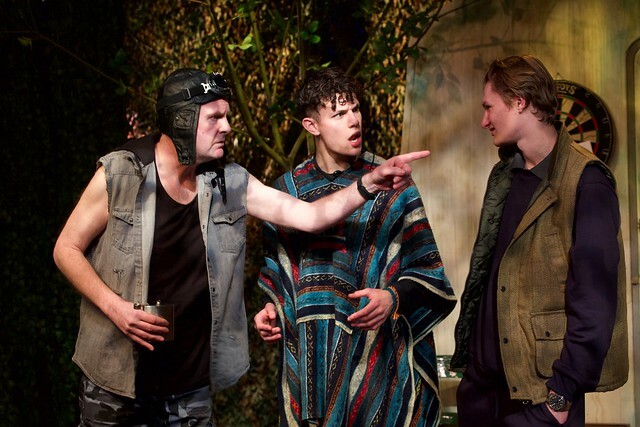 These include Davey Dean, the abattoir worker whose “ears pop” if he travels beyond Wiltshire (a delightfully droll portrayal by Rex Rayner), the green sequin-clad Ginger Yates (the superbly substance-confused Joseph Morbey) and Lee Piper, who has Antipodean aspirations (a hilarious, heart-searching performance by Laurence Maguire… we particularly liked his one-legged sawn off trouser look! They are aided and abetted by Pea and Tanya ( the delightful Imogen Pike and Natasha Hall) who emerge bug-eyed and dishevelled from beneath the caravan… and by the fabulously eccentric Professor (Alison Hill), who incants swathes of Shakespeare and burbles on about the mysticism of May Day. It is St George’s day, and the day of the annual Flintock Fair. Enter Wesley, embarrassingly dressed as a jingly Morris Dancer (a supremely comedic performance by John Turner) who mourns the May Queens past as he parties on down. 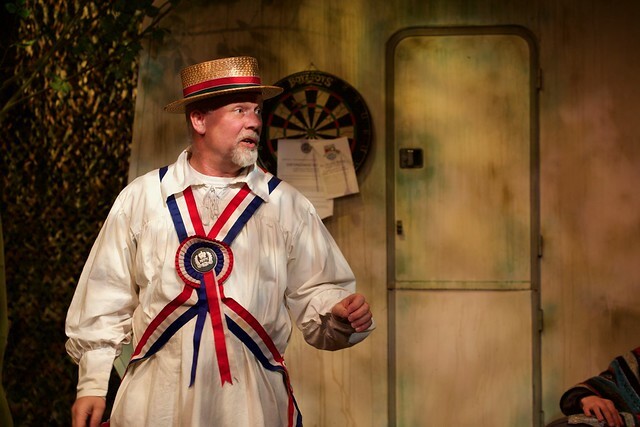 Johnnie has promised to take his son Markey (the endearing Oz Kingsnorth-Page) to the fair – but reneges on his promise. 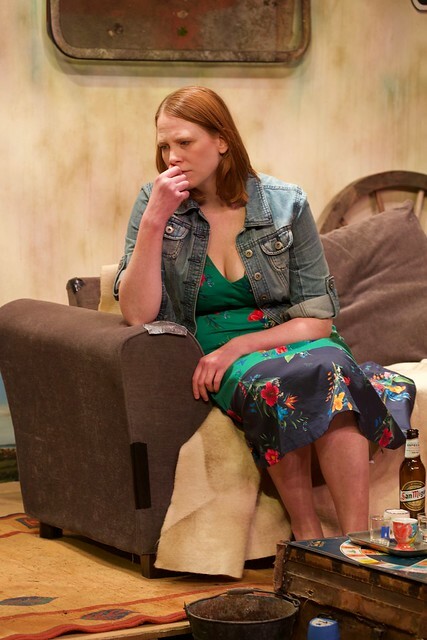 The scene shifts to a tender encounter with the mother of his child, Dawn (affectingly played by Steph Gunner-Lucas) who expresses both her affection and despair. We see a surprisingly vulnerable side to this hardened hellraiser, who boasts of being born with a bullet in his teeth. This is a richly passionate production, both funny and tragic. Don’t miss it! 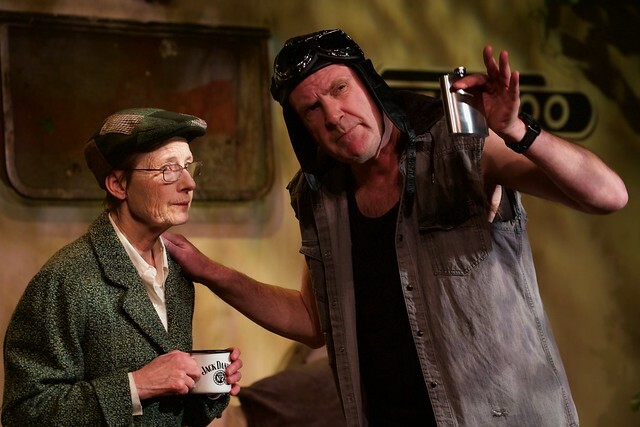 Jerusalem runs at the Progress Theatre, The Mount, Reading RG1 5HL from Thursday 7 February until Saturday 16 February. Tickets can be bought online.